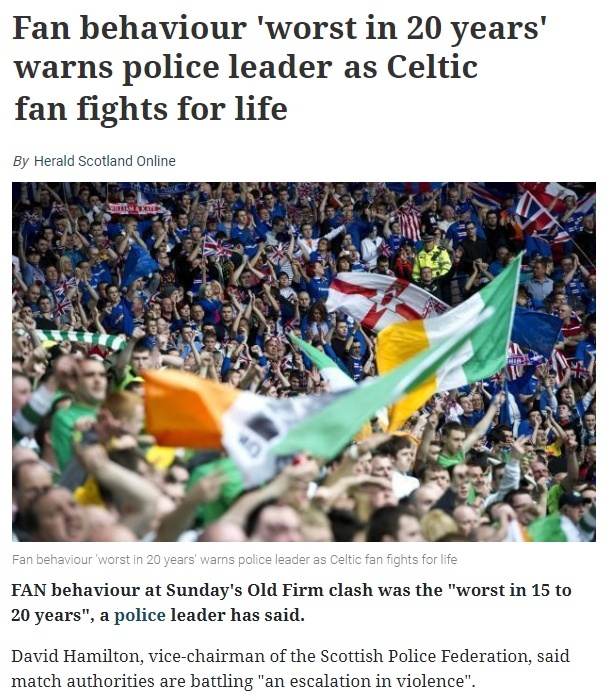 Curiously, though, the primary reason given by David Hamilton of the Scottish Police Federation (in an interview with the BBC’s John Beattie on Monday) for the recent dramatic escalation in bad behaviour at football – which has also seen fans throwing bottles and coins at players and invading the pitch to attack them – didn’t make it into the pages of any of the newspapers which headlined his comments. So in case you missed it, here’s what he said. Who could ever have imagined, eh readers? 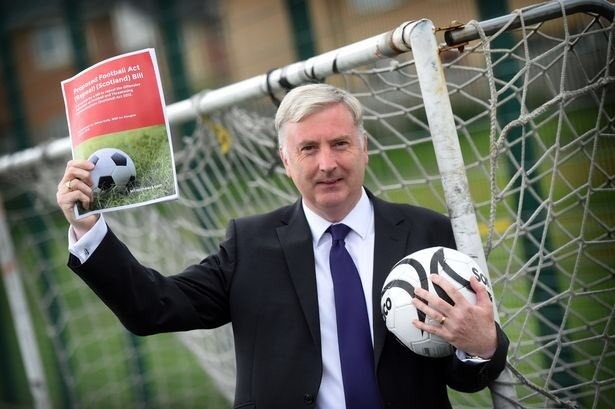 The papers curiously neglected David Hamilton’s view because reporting it might have caused them at least a small pang of conscience over the reckless and negligent way they consistently misrepresented public opinion about the OBFA, a law the Scottish public overwhelmingly supported and believe should never have been abolished. Not one Scottish newspaper, not even one columnist, spoke up for the views of the Scottish people during the years the Act was in place. Politicians of every opposition party ignored the views of their own voters and of football fans. 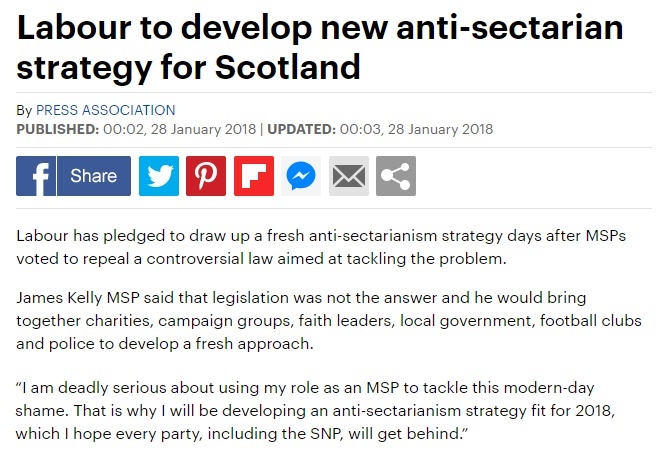 James Kelly, the man chiefly responsible for repealing it, utterly failed to deliver his promised alternative anti-sectarianism plan last year and hasn’t said a word about it since. 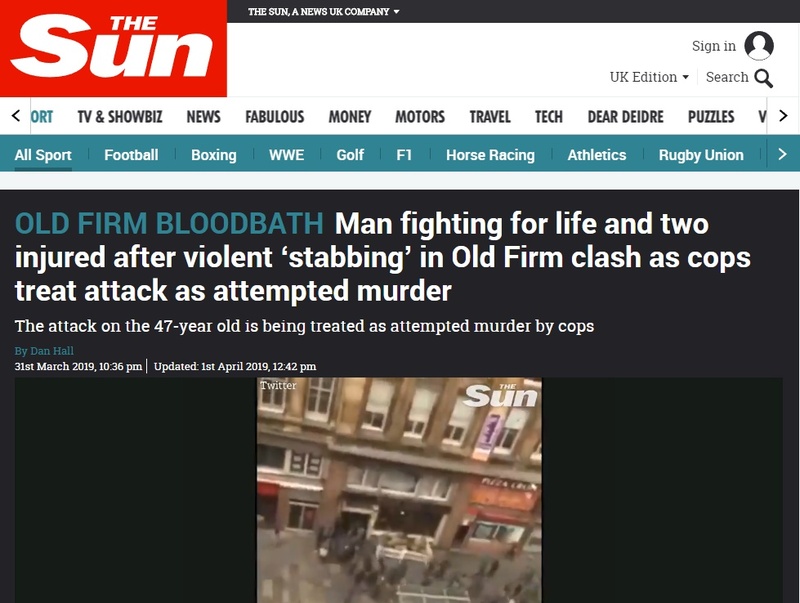 It is perhaps the least surprising occurrence in Scottish history that after the authorities sent two large groups of knuckle-dragging bigot thugs the message that sectarianism was fine again, they reacted by ramping up their hatred. 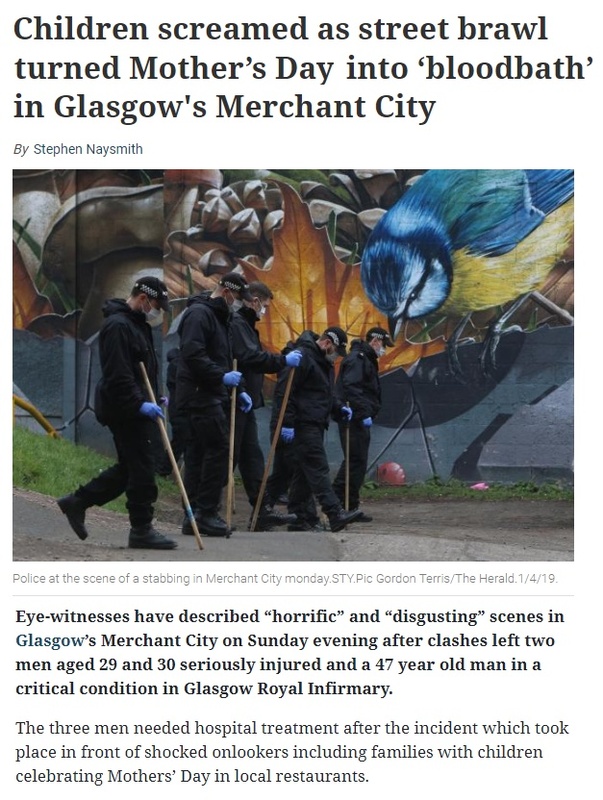 But it’s an occurrence in which every opposition MSP and every member of the media, along with imbecile bigots like Labour activist Jeanette Findlay, was knowingly complicit, all driven by their own sectarian tribal hatred – in this case of the SNP. Every one of them has blood on their hands today. We can only hope that they don’t also have to answer for a funeral. Two lots of links failed to post. I have no idea what the problem is, whether they are caught up in the system somehow? I checked for banned words and can’t find any. Tried posting them in blocks of three with no luck. and the UK incompetent gov did not speak with French ports in no deal plans. Mornin’ Nana. Some good catches early doors. The Irish Times View commentary, Business for Scotland and Mike Russell twitter link on Ms Leadsom are keepers. Sometimes helps if people step back from problems of the issue by issue nature and look at the actual nature of a thing right enough. For an academic that Prof. Adam Tomkins is a bit liberal with his interpretation of reality and facts. He certainly has a rather bizarre appreciation of what moral democracy looks like. Certainly not someone who I would want shaping young minds. That’s contemporary Britain for you though, a dysfunctional, neo-fascist state run by ignorant, chinless wonders and their minions. I see Gordon Ross as a kind of outrider. He is Indy “Recon”… his indycar has Radar and antennas like an early warning system, but sometimes interpretations of the early blip change when you get more information. Sometimes it’s nothing. It’s the nature of things. It’s how “early warning” works. May Gordon keep doing exactly what he does. I wouldn’t get bogged down about trading oil rigs, but the wider question to think about is whether the English could be influenced and given incentive to behave like adults about Scotland’s Independence, rather than hysterical spoiled brats who’ve been told their getting less pocket money. People don’t warm to it, yet, but I honestly believe we should put the feelers out about Scotland presenting its credentials as trading intermediary between the EU and a Brexited England could give both the EU and England a way out of their trials and tribulations. The Withdrawal Agreement is NOTHING. Wait until the Trade and Relations negotiations afterwards… England is paddling its canoe into deep water. A little bit of Scottish “marriage guidance” might help avert catastrophe for them, and help us get ourselves established as the universal good guys. It is already dawning on the English that Brexit has been a running jump into the unknown, and that’s before they realise the UK is coming to an end too. A year from now, the attitude of an English Parliament towards a Scottish Parliament which wanted its freedom yes, but which did not want to abandon England to the wolves might see a much more constructive relationship developing between Scotland, England, Ireland and the EU. England cannot keep going on the path it is choosing to set itself upon. It’s kind of ironic, but when Alyn Smith asked Europe to keep a light on for Scotland to find its way home, I thought that’s exactly how we should be treating this great misadventure of the English. Scotland knows its way home, but England is lost and only beginning to stumble in the darkness. Morning Macart, have another cup, go on go on…. Routine HPV vaccination in Scotland has led to a dramatic drop in the cervical disease which can lead to cancer, new data reveals. Nana , having just listened to the commander and then scrolled on down the comments – always depressed or angered by ignorance – it occurred to me that I have no idea why we are still, or ever were in Afghanistan. We had the government spokesman tell us at the time we’d be out by Christmas with never a bullet flying. Then we had the unsavoury sight of the Whitehouse incumbents gasping and clutching their pearls at the video we were not allowed to see but was apparently the demise of Osama Bin Laden executed by the heroic Yanks – which is what I thought was the excuse for invading a sovereign country , yet again. Can anyone tell me why the british soldiers are still an invading force there? Are we being fed some ‘humanitarian’ poppycock again/still? As for the drivel whipped up against Mr Corbyn by the media about how he is pally with Hamas and the IRA – it is truly time for the British Empire to have a large mirror and magnifying glass held up to their activities around the world and for the media to tell the awful truth. This is evidently an entire state being taken hostage by a cabal of crooks (1st ref) and liars (2nd ref). A soft coup with just a hint of menace behind it. I can’t believe The Sun is in the least “red-faced” about what it promoted, as JK suggests, because the name of the game up here is to keep the switherers confused and disengaged, and there is no better way to do so than convince them that there’s no hope of a better alternative. By any means necessary, without shame or regret. If the Lab-Con Cartel gets its way, freedom of movement is gone. An expired parrot. If there is a stitch-up, that will be at the very poisoned heart of it. The socialism of Corbyn Labour isn’t looking too much “international” these days, more like a lurch back to the old unloved GDR, which chose to wall-in its own people. The only difference now is that the Britwall is virtual. Well, I defy these arrogant exceptionalists now to dare try to claim the moral high ground and accuse the indy movement of being “inward-looking”. Easy! 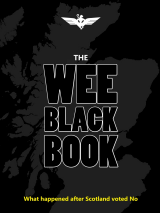 You point out it is extracted from internationally recognised as Scottish territorial waters or from internationally recognised Scottish continental shelf all under Scottish jurisdiction. Thus Westminster has stolen it and those you claim own it have only leased it illegally from the Westminster de facto parliament of England and those who buy or lease stolen property do so at their own risk of having to return the stolen property to the legal owners. You are a numptie, an idiot and a would be Troll. You will henceforth be ignored as a total waste of time. Y’know, we generally laugh at Trump when he prates repeatedly to his mob about “build the wall”, but in fact we’re getting pretty much the same thing from the Lab-Con leadership. It’s just that they are more discreet. They don’t say it out loud-and-proud, instead they are praying, silently and persistently, but it’s for the same damn thing. FM Sturgeon, which is more important, stopping a UK EU exit or Scotland exiting the suffocating, lethal Anglo-Scottish union? Morning Dorothy, like you I have no idea why we are still there, but you can bet your last penny the arms dealers do. what angers me most is how labour and Tory governments have always had the means to curb immigration sensibly but chose not to. These gammon faced bigots have had their days in the sun, travelling around freely yet happy now to take that pleasure away from future generations. Unforgivable and the backlash is growing. £40 grand to wipe their fevered brows! Nah! No where and at no time have I ever claimed to know it all? You, on the other hand post ream after ream of gobbledegook that few, if any, other commenters read and even fewer understand. Wullie Drappit the Invertottie Howkers goalkeeper is not going to understand a word of it and the chances of those comments making the slightest impression on the numbers of No voters and turning them to YES voters is nil. Jock Dissit, the Orraman at, “The Mains”, at Inverdochgarroch isn’t going to change his lifelong, “Folla the Maister”, voting pattern by reading reams of theoretical pish. Nor will it help that these ordinary people will become confused as to what you are referring to when you can’t even distinguish correctly between what comprises Britain, The United Kingdom and The kingdoms of Scotland and/or England. The fact that you cannot/will not only serves to reinforces the propaganda the people of Scotland have been subjected to by the unionists since birth. Some Wingers, including myself, have begun to wonder exactly what your motives might be. The very history, if any, taught in our Scottish Schools is laced through and through with total lies and with very misleading assumptions. I’ll only quote one, fairly simple to understand, example. There was no Union of the Crowns in 1603 excepting for the monarchy personally but this is the pivot on which Westminster bases its claims of holding total sovereignty over Scotland. That and the assumption that the English Rule of Law established before there was a Treaty of Union is the assumed law of the United Kingdom. Yet the actual Treaty of Union itself states this is not the case. 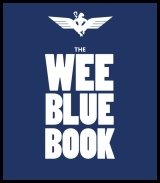 So while the man in the street will have no understanding of the theories you push here on Wings he will understand that Westminster has no actual legal claims upon the sovereignty that belongs legally to the people of Scotland not has claims upon the assets of the Kingdom of Scotland without the express permission of the legally sovereign people of Scotland. For heaven’s sake, Cameron, a fair proportion of the people of Scotland do not even know they are legally sovereign. Now, I’m finished with you. Get lost. Since the War, there has not been a political event like Bre in the UK, It is beyond description as well as beyond resolution. It is as if the UK body politic has suffered a ‘stroke’, resulting in one side of the body being paralysed and disabled, while the other side remains as normal, but being part of one body, has to suffer the consequences of the ‘stroke’ all the same. Further, denial has set in, and with it, half the population appear unable to see things as they are, believing instead that leaving the EU will be fantastic for Great Britain. No analogy is perfect, including this one, Brexit-stroke. But one further element is worth mentioning. While no two strokes are ever the same, recovery from stroke is invariably a slow business. In the case of the Brexit ‘stroke’, the severity of it would indicate lasting damage to the UK, though with some recovery still possible. The alternative is la-la land. Why wouldn’t they? After all, “war is peace, freedom is slavery and ignorance is strength”. I see a poll is saying everywhere in England outside the M25 is happy to go with ‘no deal’. If there is a ‘no deal’ Brexit, it is only fair with shortages of medicines, fresh food, spares, toilet rolls that Leave voters should volunteer to be the ones who suffer most. What are the chances of Brexiteers saying, “I brought this down upon us, so I will do without”? Nah. They will be kicking the sick and frail aside to make sure they get what they need. … rather than trying to trash England. No one needs to trash England, HYUFD, (and by England I refer to the Kingdom of England), for Westminster is doing an excellent job of doing just that all by themselves. While also, at the very same time, ignoring their only legal partner kingdom in the United Kingdom. Not to mention they do their level best to also ignore the other countries that comprise their Kingdom of England. It is neither the Kingdom of Scotland, the SNP or the other countries in the United Kingdom that is Trashing England – it is England itself and I certainly cannot blame Scotland, Wales and Northern Ireland for doing their level best to protect themselves, and their citizens from the inevitable consequences of this current idiocy that will benefit no one except the self-chosen few. No one, not the EU, the UK or the individual kingdoms of the UK or the individual countries of the UK will be better off if/when the United Kingdom, (not Britain), leaves the EU – with or without any kind of deal. The only people to benefit will be those select wealthy dynastic families who made their fortune from the worst excesses of the British Empire and then moved their wealth away from the United Kingdom to protect it. The EU are about to stop all that and hence the mad rush to get the UK out of the EU before the EU stops these wealthy families despicable greedy actions. They want everyone else to suffer to protect their ill gotten wealth. There is no such thing as a, “British”, Constitution, Wingers. There is no such thing as a British Constitution, Wingers, because Britain is not a political state it is a geographic feature. Well constructed and extensive report to offer advice to No Brain, No Deal Brexiteers! It will be interesting to see what May and Corbyn cobble up between them on Brexit. And it will also be interesting to see the reaction of those in the Labour party who support remaining in the EU What will they do, will they simply grin and bear it or will they leave Labour? As for any snap general election, how will a Corbyn/May Brexit deal go down with the electorate, particularly here in Scotland? Give a rest for goodness sake. Their are much more cretins to be countering among the unionists than on Wings by people on their own side. See who the opposition really can be. Not amongst the Independence supporting community. Go off topic through the night. Every time Rev Stu is otherwise engaged the unionists think they will contaminate and attack the site. Do not rise to the bait. Rev Stu will sort it out later, when he has time. The total and utter appalling Brexit mess. Ehat a shambles, with little end in sight. There will be a GE the Tory/unionists can lose to try and dirt out the mess. Hopefully sometime soon. May/Corbyn and the rest are useless. Absolutely useless. Appalling useless. The Westminster unionists sychophants being show up for the bigots, racists, misogynists,paedos that they are. A total embarrassment. Wasting public money like there is no tomorrow. Sanctioning and starving people to death. Illegal cuts brought in for women and children on ‘Mother’s Day’. The appalling unionists policies. Killing people and death. D’Hond’t and STV introduced in Scotland without a mandate to muck up democracy and the Scottish economy. The loser wins. (Leslie Evans). Letting useless, lying unionists and others in to muck up the Scottish economy and democracy. 4th rate losers embezzling and wasting public money like there is no tomorrow. Most of them should be in jail. People would be in jail for behaving like some ‘sporting’ fans. Getting away with murder. Paedos, bigots, racists,misogynists running the ‘business’. Corruption and breaking the Law with impunity. They should be put in jail for violent alterfracation. No one is safe on the streets because of It. A public order issue. The Directors should be held liable and fined. They are breaking company Law. The millitary are involved. Condoning the disgraceful illegal behaviour. No wonder the terraces are empty. No one is safe because of it. Yup, it was all going to be so easy. And despite attempts to rewrite history, no one was selling a ‘no deal’ exit! What it does show is the Leave merchants were just making it up as they went along! They appear to have had no comprehension of how the mechanism would work – first the divorce deal, leave, THEN negotiate the future trading arrangements. Also, their ‘forgetfulness’ about Ireland and the Belfast Agreement is now a legend! Thanks for the links Nana. I see that brass necker Tomkin’s (7:28am) is blaming the “people” for the Brexit debacle now just as his boss, Big T, blamed Parliamentarians. I doubt that even Tory supporters, intelligent that is, will be taken in with this lots confabulations and that will become apparent at the next Election. Jenny Marra being exposed as a liar once again. England is heading for civil war, after Brexit things will start to get serious as the implications will start to hit home. Even semi serious brexiteers will learn they have been had and were on the wrong side. However on the other side are the hardest Brexiteers egged on by Mogg and his motley right wing Britidh Nationalist crew. London is likely to turn into a very unsafe place. The police and even the army will not be able, nor do they have the numbers to cope as serious crimes escalate. The disturbances will spread over most of England, but lesser in the North, and the very south where people again realise that they were conned. Scotland cannot stand by if this happens,we need to get out and also disassociate ourselves with these events. They will undoubtedly be of concern to us and we need to make sure by whatever means we have, that our people are safe. Eventually, I can easily imagine the Northern counties of England applying to join with Scotland,simply because the may have more in common with us than with their southern parts. You may think this is just ficticious, well we will see. Looking at the whole picture of this, I personally think it is more likely than ever to come about. We really need to stop messing about trying to protect England from itself,it is in freefall. We really need out before the fuse is lit,it may be on the slow burner already. Ooooh! So it’s SNP very, very, very BAAAAAD! Again then is it? For anyone interested in the territorial claims on oil & gas fields offshore Scotland following our independence, it is instructive to recall how HMG has dealt with its territorial claim to Rockall. Hello Nana thanks for the post 4th april regarding the reduction in Cervical Cancer in Young Women. I have been noticing over the past number of years at the alarming increase in OBESITY in young women and put this down to the uptake of the HPV Vaccination programme introduced in 2008. I refer to the Paper produced in the web site http://WWW.Vaccines.Net which sites a research paper that claims “Vaccines not Diet” are Causing the increase in Obesity in young women. Girls who receive the HPV Vaccine have their Immune Systems become hyperactive producing increased Cortisol and other immune suppressing Molecules to suppress the Vaccines induced Inflamation. This increased production leads to Obesity. The paper reviews proof that the Vaccine is much more dangerous than the Public is lead to believe. Adequate testing has never been performed. The major problem is that in order introduce protection for the 1% of the population with the weakest immune system the Vaccine over stimulates the immune system of the remaining 99% leading to the epidemic explosion of Inflammatory disease including Obesity.I welcome the reduction in Cervical Cancer in women but can’t help noticing a side effect of the alarming increase in OBESITY in young women since this Vaccine was promoted and introduced. From the New York Times, is simply excellent regarding the madness in England right now. Quote “..They don’t seem to be listening at all to people like Tom Enders, C.E.O. of the aerospace giant Airbus, which employs more than 14,000 people in the U.K., with around 110,000 more local jobs connected to its supply chains. Enders has warned the political leadership here that if the U.K. just crashes out of the E.U. in the coming weeks, Airbus may be forced to make some “potentially very harmful decisions” about its operations in Britain. Just thinking of the article above in my comment, perhaps an independent Scotland within the EU, could build the wings for airbus?? I see, on double checking the Joanna Cherry link, that Mark Carney was in Glasgow yesterday. Does anyone have a video link to his speech rather than being brainwashed with the garbage being published in the Scotsman etc? Well, that is interesting, especially, as you point out, the last few lines. Well, well. 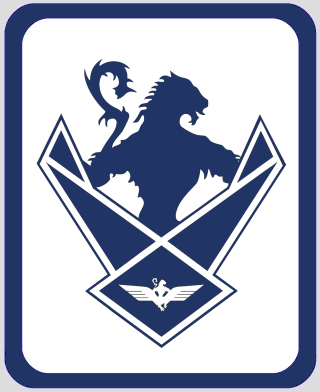 Possibly at the Scottish Government owned Prestwick International airport – especially with its exceptionally long runway. Robert Peffers. I am not interested in being better off. Getting out of the bullying EU clique is far more important than that. They turned Greece into a basket case and would do the same to us if it was in their interests. I thought there was a time when Scottish Nationalists wanted independence and not dependence on the EU. A lot seems to have happened since the SNP opposed the EEC. Didn’t take the anti-vaccine mob long to try and dampen the cervical cancer success story. That vaccines.net site can best be summed up by this from 5 years ago. You are correct to point out that Airbus can get it’s wings made elsewhere. I understand Boeing gets assemblies from The Phillipines for the B787. Belfast builds wings for Airbus. Engines for GM are built in Australia. The World has become a small place with Globalisation. Regarding the HPV vaccine success story from Scotland today, no doubt many folks in the BBC propaganda HQ at pacific quay, will be running around trying to find a negative angle to it. Re The Sultan of Brunei. At the time of the Charles/Diana divorce I seem to recall that there was a rumour that this guy paid for his (Charles) cash settlement to Di rather than it being a big hit on the finances of The Duchy of Cornwall. My recollection of this matter is that such speculation was rapidly killed off. Yip. But England wants to shut itself off from the world. The sooner Scotland is affirmed in the EU and becomes independent, the sooner, Scotland can start to capitalise on these sitting opportunities. With the demise of the A380, All the airbus wings can be flown to toulouse, and a long runway – like at Prestwick, makes it all the easier. Just one small example of how Scotland can literally steal these opportunities away from narrow minded, racist, ‘brexit’ England. The NY Times article does kinda hit the nail on the head. And turned itself into a bigger basket case after joining. I know! I Know! Your interest rests only upon trolling and idiocy. I’m wearing my sceptic’s hat for the NY Times article. It seems the writer doesn’t do irony. Does that include the mp? OT. TODAY. New YouGov Poll from the Evening Standard London. EVERY REGION OF ENGLAND AND WALES APART FROM LONDON IS HAPPY TO LEAVE THE EUROPEAN UNION WITHOUT A DEAL, A POLL HAS REVEALED. Some of you seem to have missed this but it was posted by Nana yesterday morning at 7.17am ! I don’t get this idea that the Cooper/Letwin deal takes no deal off the table or changes where we are. From what I can see it says that May has to ask for an extension (she already said she was going to so they’ve not really forced her to do anything she wasn’t going to do anyway) and that the length of that extension needs to be agreed with parliament. So first part is that the EU need to offer an extension and that requires some plan of some sort and thats were it falls apart. May is unlikely to provide a plan that offers May and extension to just 22nd May so that means the EU will only offer a long extension (perhaps as long as an EU parliament i.e. 5 years) with conditions i.e no rebate. That won’t be acceptable to the Tory party so if it comes back to parliament and its no deal or a very long extension I can’t see parliament voting for the extension which means by default they vote for no deal. That vote would have to be next Friday. To secure a short extension May is going to have to offer either a second referendum or a general election. A second referendum is not possible in the timescale of a short extension. A general election has 2 problems. If May holds to her word and won’t be the tory leader at the next GE then she needs to allow time for a tory leadership election prior to the GE so probably not enough time within a short extension for that. Or if she decides to go with a GE with her as leader chances are England votes in a more pro-no deal government with a majority that will simply force a no deal. Same applies if the Tories replace her in an expediated fashion. After Brexit, the term “basket case” needs to be recalibrated anyway. Is it not a fact that the reason for invading Afghanistan is that the yanks wanted to build an oil pipeline from the former Russian republics adjoining Afg down and and out to The Indian Ocean via .Pakistan so avoiding having to pipe it thru the Russian Fed. The reason for the US led invasion was that the Taliban gave asylum to Bin Laden after he boasted about his part in the 9/11 attacks on the World Trade Centre, killing amost 10,000 Americans. The Taliban government were probably one of the most extreme religious regimes in the world and repeatedly refused to expel him or give him up. The oil pipeline story was just that – a story, – from the same conspiracy theorists that claimed the CIA or the Jews destroyed the Worlsd Trade Centre. WTC deaths were nowhere near 10,000. During the September 11 attacks of 2001,2,996 people were killed (including the 19 hijackers) and more than 6,000 others injured. These immediate deaths included265 on the four planes (including the terrorists), 2,606 in the World Trade Center and in the surrounding area, and 125 at the Pentagon. The real number is still a huge number, but lets not revise history. If you believe America invaded the country hiding Bin Laden, rather that the Country who FUNDED Bin Laden, for any other reason than using 9/11 as an excuse to go finish the job Daddy started previously, you are in need of a wee lie down. The recent 4 page A4 leaflet from Masterton MP and Carlaw MSP does not have a single word about leaving the EU. Not one word. The biggest mess in most people’s lifetime and the local Tories just ignore it. East Renfrewshire/Eastwood is of course a very high remain area. So their approach is just to ignore the leaving the EU mess and get stuck into the SNP with a bunch of misleading stories. The top story is stop the SNP car park tax. Both of the plonkers are pictured (in a local school car park) holding up signs saying Fee paid £500. All the Britnats have got is lies and more lies. I was thinking exactly the same thing this morning. I know that if I lived in the Northern borders of England I would be looking north for government – free prescriptions, personal care, baby boxes, bus pass, better NHS, possibly lower income tax, and many other facts. The Far north of England has suffered for a long time from being remote from the seat of government and does not have its economy sustained by industry and other means and transport links as is the case from Liverpool across to Newcastle. ” … I’m wearing my sceptic’s hat for the NY Times article. Yeah! Mike, and you are not the only one with that hat on. I have a very old New York Times subscription tucked away somewhere. Many years ago I pointed out their failure to understand what the United Kingdom actually was. This after an article that thought it was variously, England, Britain and so on while also thinking it was, “a country”. It made no impression pointing out that it is titled, “The United Kingdom”, for the good reason that is what it is and there are only two Kingdoms with signatures on the Treaty of Union. That what constituted the United Kingdom was the Treaty of Union and one kingdom plus one kingdom equals a bigger united kingdom and not a bigger united country, for if it was a country it would be called the United Country of Great Britain & Northern Ireland and last time I looked it wasn’t called that. I thus stopped bothering with my subscription to the New York Times with this little added information at the end – mark my words well – in the not too distant future the Kingdom of Scotland will have suffered enough and will dissolve the Treaty of Union. 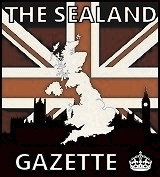 Thus there will be no United Kingdom for the United Kingdom only has two partner kingdoms so a united kingdom cannot exist with only one kingdom. I kid you not – this was somewhere around the mid 1980s. Is it any wonder I’ve lost all patience with numpties who carry such counter productive notions? I thought you were a bit of an arse when you first posted on here. Thanks for proving me right. You sir, are what is called a fanny. A overly verbose and boring fanny at that. Go on yourself, you appear ken it all. I have one question now. You are not stupid. Why are you behaving so stupidly? Stupidly? I’m the one being attacked. 2. Play the ball, not the man (or woman). And by all means disagree, by all means disagree forcefully – but argue with people’s views, don’t insult them personally. 3. Show other commenters some courtesy. It’d be nice if all that ever mattered was the content of what you wrote. But it isn’t. Whether we like it or not, the way things look also has a huge effect on whether people read them and pay any attention. Slight confession, I was overly bothered about Venezuela and it’s oil. I mean I didn’t think it was a good situation, but it was far away if you know what I mean, and how big a crisis can it be when it’s just a storage container blocking a road? But looking at the map in Rev Stu’s Twitter feed, we’re talking more oil, a lot more oil than the Saudis have got. Venezuela has won the oil lottery big time. No wonder the USA is trying to muscle in. South America might be the new Middle East if we’re not careful. My apologies Venezuela. I didn’t really appreciate your predicament. I’m not concerned about egos, I’m more concerned about what I perceived as an attack on the “value” of the knowledge I am trying to share. That concerns me and I’ll defend my contribution as robustly as I see fit. Let’s leave it there shall we? Thanks for posting on here Alan. Interesting and worth following up. Cubby do grow up. The anti brexit movement along with the media and Mrs May have been doing the dirt since the shock vote to leave. They intended to make it all look like a dugs breakfast and have. He is well known in medical circles and I would urge extreme caution. The ethical communication of knowledge is fraught with danger, especially bio-medical science. ethical principles of respect for persons, beneficence (doing good), nonmaleficence (not doing harm), and justice (treating people fairly)—the cornerstones of modern ethical codes for the health professions. Behave yourself or it’ll be no supper for you. Sorry Stew, but you’re wrong that no columnist wrote in support of OBFA. I consistently supported it at first and then when it was clear the law was imperfect I called for changing OBFA and absolutely not repealing it, for as I wrote in The National as long ago as June 2016, October 2017 and March and December 2018, repealing the Act was sending the wrong signal to the hooligan tendency. Got plenty of pelters from the James Kelly fan club, FAC etc, but hey, not hearing from them now. I called for a public inquiry into the problem of sectarianism in my column in Friday’s National. I hope you can support that.